Why have a Sumatanga Sunday? Because the work of God's Kingdom should be shared and celebrated! Because Sumatanga strives to provide stellar and relevant opportunities for youth, adults, families, and individual with special needs, in an environment dedicated to Christian transformation. Your prayers, presence, and gifts provide us, in part, with the means to continue offering such opportunities. Because growth and innovation happens when people rally around and support great ministry. Previously, funds from Sumatanga Sunday have been used for things such as staff development and new personnel, maintenance projects, program development, and more! Because the values of Christian camping are immeasurable! Campers and guests leave Sumatanga ready to ignite their family and community with the Christ-centered values of love, compassion, thankfulness, forgiveness, and acceptance. Because God has wonderful plans in store for the ministry at Sumatanga! How can YOUR church participate? Option 1 – Show our video (below) to your congregation on August 13th, have our ready-made bulletin insert available for your members, and ask for a special offering for Camp Sumatanga. Option 2 – Show our video to your congregation, use our bulletin insert, and invite members of your congregation to share their personal faith story or memory from Camp Sumatanga (you'll be surprised at how many people want this opportunity to share!). Follow this message by taking up a special offering for Camp Sumatanga. 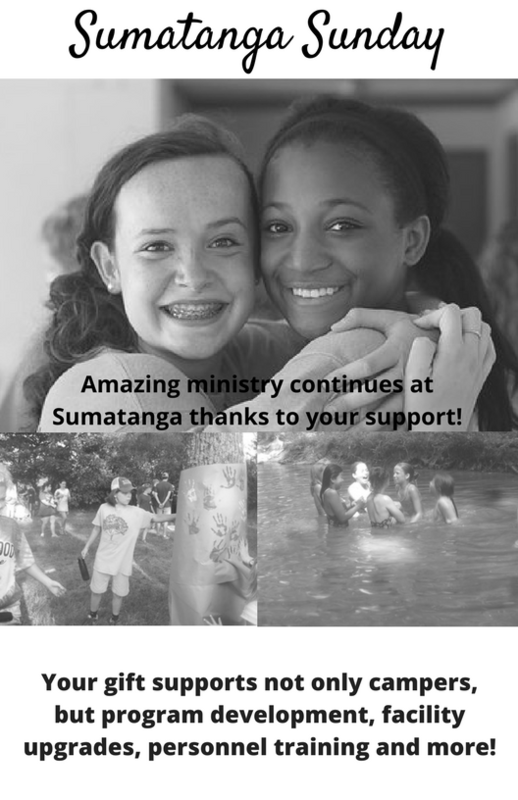 Option 3 – Show our video to your congregation, use our bulletin insert, and invite members of your congregation to share their personal faith sotry of memory from Camp Sumatanga. Use a few camp songs during your worshi experience. Consider using one of the Children's messages below and center it around an imitation campfire. 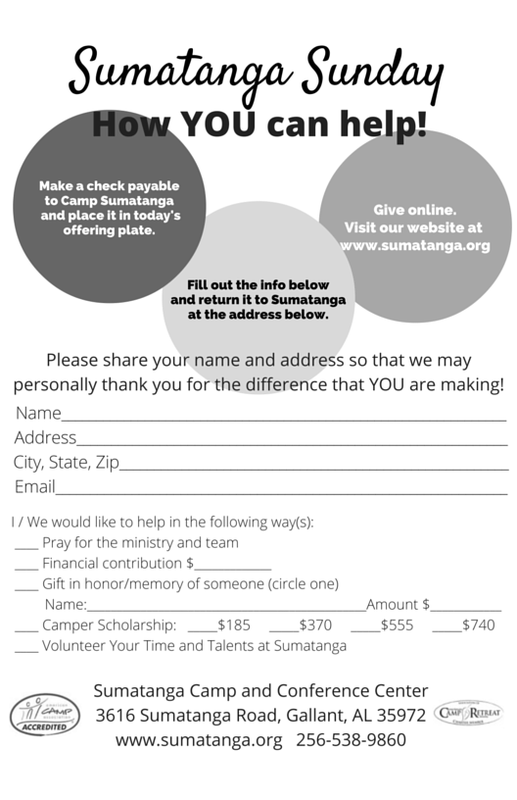 Follow the message by taking up a special offering for Camp Sumatanga. Find many resources on our website: www.sumatanga.org and use the attached ready made bulletin insert at your home church! Explain to the kids that we are like this broken clay pot. God stores His love or “great treasure” in us. But we have cracks or problems just like the clay pot. Ask the kids why God would store His freat love in something so broken. Pour the water into the pot to show how broken it is. Then tell the kids that the lamp is God’s love. Place the pot over the lamp and show the light through the cracks. End by explaining that God stores His love in broken things so that it will shine through the cracks. Talk about how the seed becomes a whole new creation (the plant that then produces more seeds). For older children you can go into what it looks like for God’s children to “bear fruit”. For younger children you can talk about God’s unlimited power and His ability to create all things and provide for all of our needs. Each child can take home either the pot and seed (which they can poke down into the dirt during the lesson) or you can send them home with the seed paper to plant on their own at home. Don’t forget to go into the importance of watering it so that it continues to grow, just as we need to continue to be filled by the Holy Spirit so that we can continue growing in Christ.